April 1947. <clipping> Monday, April 14, 1947 Society Notes W.C.T.U. WILL MEET IN STEWART HOME The W.C.T.U. will hold its regular meeting Tuesday, April 18, at 2:30 p.m. in the home of Rev. and Mrs. W. J. Stewart, 1015 Fifth avenue. The program topic, "The Youth of our Community," will be presented by Mrs. L. E. McCargar. Rev. L. E. McCargar will be the devotional leader. All persons interested in temperance are cordially invited to the meeting. <end clipping> The W.C.T.U. met April 15 1947 at the home of Rev. and Mrs. W. J. Stewart. Rev. L. E. McCargar led the devotions, using the hymn, "Let the Lower Lights be Burning", and the scripture as found in I Timothy 4:12, with appropriate comments. Mrs. L. E. McCargar had charge of the Program, "The Youth of Our Community." She gave a number of excerpts on youth conditions as given in the Union Signal. The Misses Maxine and Wilma Russell sang a duet, "I Would Be True", accompanied at the piano by Rev. McCargar. Mrs. Vera Sammon gave an interesting talk on Iota Sigma, W.C.T.U work. We hope Mrs. Sammon will be able to organize one here in the near future. The business meeting was in charge of the president, Mrs. Hicks. A verbal report of last meeting was given by Mrs. McCargar. A petition protesting liquor advertising over the radio and in daily papers was presented by Mrs. A. W. McBlain. Several more signatures were added. A new member, Mrs. Sylvia Sparks, was added to the roll, and dues of one dollar paid. There were 13 present. Meeting closed with prayer by Mrs. Ralph Allen. An offering of $1.62 was given. It was a rainy afternoon. Mrs. A. W. McBlain, Sec. pro tem. <clipping> W.C.T.U. WILL MEET WITH MRS. JACKSON The W.C.T.U will meet Tuesday, June 17, at 2 p.m., with Mrs. H. A. Jackson. Mrs. Katherine Raffety is the program leader and Mrs. Geo. Renaud, the devotional leader. All interested in temperance are invited to attend. <end clipping> <clipping> W.C.T.U MEETING WILL BE TUESDAY AFTERNOON The W.C.T.U. will meet Tuesday afternoon, May 20, at 2:30 o'clock with Mrs. H. A. Jackson, 1203 Main street. Mrs. Catharine Raffety is the devotional leader and Miss Nellie Lincoln the program leader. April 1947. 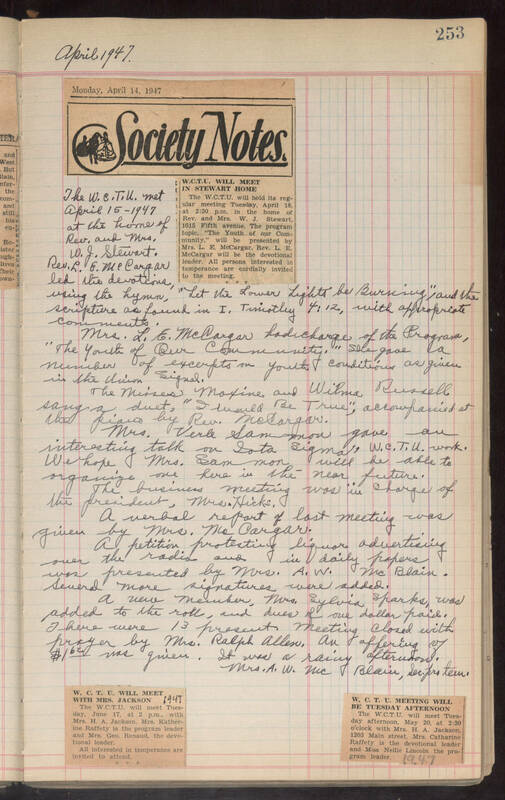 Monday, April 14, 1947 Society Notes W.C.T.U. WILL MEET IN STEWART HOME The W.C.T.U. will hold its regular meeting Tuesday, April 18, at 2:30 p.m. in the home of Rev. and Mrs. W. J. Stewart, 1015 Fifth avenue. The program topic, "The Youth of our Community," will be presented by Mrs. L. E. McCargar. Rev. L. E. McCargar will be the devotional leader. All persons interested in temperance are cordially invited to the meeting. The W.C.T.U. met April 15 1947 at the home of Rev. and Mrs. W. J. Stewart. Rev. L. E. McCargar led the devotions, using the hymn, "Let the Lower Lights be Burning", and the scripture as found in I Timothy 4:12, with appropriate comments. Mrs. L. E. McCargar had charge of the Program, "The Youth of Our Community." She gave a number of excerpts on youth conditions as given in the Union Signal. The Misses Maxine and Wilma Russell sang a duet, "I Would Be True", accompanied at the piano by Rev. McCargar. Mrs. Vera Sammon gave an interesting talk on Iota Sigma, W.C.T.U work. We hope Mrs. Sammon will be able to organize one here in the near future. The business meeting was in charge of the president, Mrs. Hicks. A verbal report of last meeting was given by Mrs. McCargar. A petition protesting liquor advertising over the radio and in daily papers was presented by Mrs. A. W. McBlain. Several more signatures were added. A new member, Mrs. Sylvia Sparks, was added to the roll, and dues of one dollar paid. There were 13 present. Meeting closed with prayer by Mrs. Ralph Allen. An offering of $1.62 was given. It was a rainy afternoon. Mrs. A. W. McBlain, Sec. pro tem. W.C.T.U. WILL MEET WITH MRS. JACKSON The W.C.T.U will meet Tuesday, June 17, at 2 p.m., with Mrs. H. A. Jackson. Mrs. Katherine Raffety is the program leader and Mrs. Geo. Renaud, the devotional leader. All interested in temperance are invited to attend. W.C.T.U MEETING WILL BE TUESDAY AFTERNOON The W.C.T.U. will meet Tuesday afternoon, May 20, at 2:30 o'clock with Mrs. H. A. Jackson, 1203 Main street. Mrs. Catharine Raffety is the devotional leader and Miss Nellie Lincoln the program leader.